Hot this week: Hard to tell from Belize. A truncated try at a newsletter from the field. Trade people often cite ex museum objects as a source of ‘legit’ and ‘licit’ antiquities, yet even these items are considered tainted, albeit in a different way. See No Evil: Is Missing Artwork Sitting Inside Secure Storage Facilities? An article that goes over recent raids/seizures/etc from art storage facilities. What looted artefacts and stolen art do they contain? Yes, yes, The Goldfinch plot. The National Gallery of Australia is still displaying some idols bought from big time antiquities smuggler Subhash Kapoor. Are the dodgy too? Seems likely so we’ll see what happens there. Focused on sacred items looted from churches. Also a museum exhibit of such items has been opened called ‘Recovered Heritage’. These recovered items came from Brazilian churches but it unclear which ones as they were never inventoried. Seriously: inventory, inventory, inventory! Not ancient art, but still art theft. It all goes wrong when this person buys looted Cypriot objects. Archaeologists and police are teaming up to protect shipwrecks in the St. Lawrence. Stories of looters with dynamite and jackhammers. The piece isn’t looted and seemingly not trafficked, but the government and donors are paying for it to be returned. I and many others never saw they would see the day that the Museum of Fine Arts, Boston, would return the looted and trafficked top half of the Weary Heracles. Over 400,000 people have visited him in Turkey. Hooray! 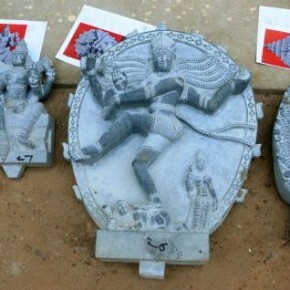 An online campaign to get the rest of these very looted and trafficked pieces home. This article concerns about 100 items taken during WWII and the Civil War. This is the Kunsthal theft. Somehow I doubt that cash will materialize. Hmm. Was a 12 month prison sentence worth getting some traction as a legit artist? Is there a risk that counterfeits will enter the market at a later date? Look, you can’t bring dozens of giant African snails into the US, even if you declare them. Fossil-hunters have removed 16 pieces of rock in a raid at Portrush National Nature Reserve. They are likely to have contained ammonite fossils.